We support our local YMCA. Please visit the YMCA web site for donation information. 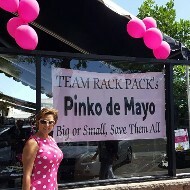 Our donation to the annual Pinko de Mayo event. Fundraising for Cancer reasearch.